With the sheer weight, towering height and excessive speeds of a horse, it’s no secret that riding can be a dangerous activity. Ensuring safe practice and keeping alert at all times can dramatically reduce the likelihood of accidents, with the following checklist providing tips on how to achieve the perfect balance between fun and safety. and how to overcome the fear of horse riding. Always wear a helmet – Fatalities are more often than not the result of a head injury, so adorn an approved helmet before mounting your ride every time you go out, even if you are not planning on traveling at high speeds. Choose a horse or pony suited to your skill level – Beginners should be paired with quiet, easy going companions accustomed to novices who make mistakes. Learn to ride with an experienced instructor – Enrolling in a class will help prevent bad habits and allow you to improve your abilities in a safe, controlled environment. 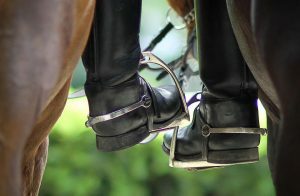 Keep your distance – When walking in a group, maintain at least one horse’s length between you and the rider in front. This can evade injury or harm if the animal unexpectedly kicks out. If in doubt, dismount – If at any time, you feel anxious or uncomfortable, alert your coach and dismount. It’s better to regroup and get your emotions under control on the ground than on your horse. Wear suitable clothing – Accidents are often caused when animals get spooked, so make sure you are not wearing any items, such as scarves or loosely fitting clothes, that could fall or become trapped in the horse’s tack. Don’t feel pressurised – If you do end up falling from a horse, don’t feel pressurised into getting straight back on. Instead, spend some time on the ground and go back to basics. Begin again with a peaceful, responsive horse, and keep your speed down to a minimum before regaining your confidence and continuing at the level you were at before the fall.